It’s almost Valentine’s day, and the six hundred different tints of pink are starting to rose up my cheeks! I suspect it to be the young afternoon breeze warming up to the arrival of spring. Or maybe it’s because the petals of my heart are awaking to seventeen years of toddler’s slumber. Call me naive, but I’m looking forward to the day when I will fall head-over-heels in love with someone who’s perfectly imperfect solely to me. But I’m not waiting around aimlessly. Singleness is the season of adventure, of preparation, and of self-discovery. This dish is just that. I’ve never tried anything as daring and as bold as this salad, adapted from Gordon Ramsay’s Maze cookbook. The beets help keep my arteries clean, and thus my heart healthy (to give to my beloved). Throughout the composition I also found a renewed passion for miniatures. The salad includes multiple components, to be executed over the course of two days. It’s a matter of time, and not complexity. 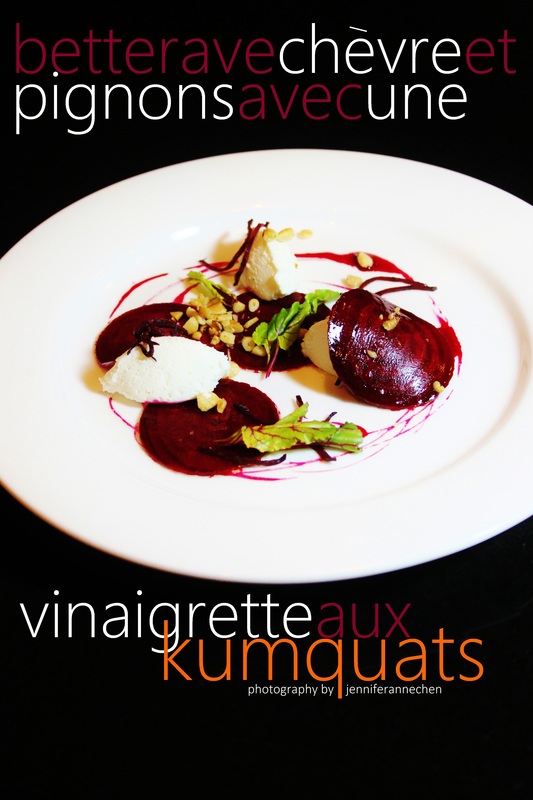 Its flavours are bright and clean, with sweet and fruity marinated beet, tangy goat cheese, and smoky roasted pine nuts. The same beet is a theme presented in three variations: thinly sliced discs marinated, string-like juliennes sauteed, and juices extracted then reduced to a syrupy glaze for the vinaigrette. Every component is necessary, fulfilling simplicity, and as they come together as a single small bite, their harmony resonates to the very back of the palate. Enjoy! To make the marinated beet, thinly slice the beets using a mandolin. Stamp out uniform discs with a 5-cm round cookie cutter, reserve the trimmings and any discs that are too small. In a bowl, whisk together all remaining ingredients. Add the beet discs, one at a time, to the bowl so each piece is sufficiently drenched in the marinade. Cover with plastic wrap and put in the refrigerator to marinate overnight. To make the vinaigrette, put the beet trimmings in a small saucepan and add enough water to cover. Bring the pan to a boil, then simmer for 25 minutes. Strain the juice and return to the pan (discard the trimmings). Boil the juices until reduced to a syrupy glaze. Let cool slightly before whisking in the marinade. To make the sauteed beet, stack the small beet slices together and cut into very thin sticks. Melt the butter in a pan and add the thyme leaves. Season the beet sticks with sea salt and freshly cracked black pepper, then add to the pan. Cook for 2 minutes, or until the beet is tender. Remove with a slotted spoon and drain on a plate lined with paper towel to rid of the excess butter. Let cool. To make the whipped goat cheese, put the goat cheese and sour cream in a bowl, season with sea salt and lots of freshly cracked black pepper. Beat with a fork until fluffy. Dip the dessert spoon into the vinaigrette and “draw” onto a clean white plate. Remember: the swifter and carefree your strokes, the more artistic and modern it will look! Place three beet discs randomly on the plate (organized chaos is the aim here). Using two clean dessert spoons, shape three neat quenelles from the whipped goat cheese and place them onto the plate, possibly overlapping with the beet discs. Top with shreds of sauteed beet, and scatter more loose strands over the plate. Drape one or two more beet discs partially over the quenelles, whatever looks nice. Finally, sprinkle on the pine nuts and garnish with the beet leaves. Tip: when it comes to plating, take your time and experiment! Odd numbers usually appeal more to the eye, and so does other forms of irregularity such as the abstract strokes of vinaigrette and lone strands of sauteed beet. As a general rule order of plating: sauce first, then vegetables and/or starch, protein, then garnish. Good luck on your special dinner, enjoy!